The general public townhall meeting regarding the release of this audit will be held tomorrow from 6:30 to 8:00 in the Sanchez Building on the UT Campus. 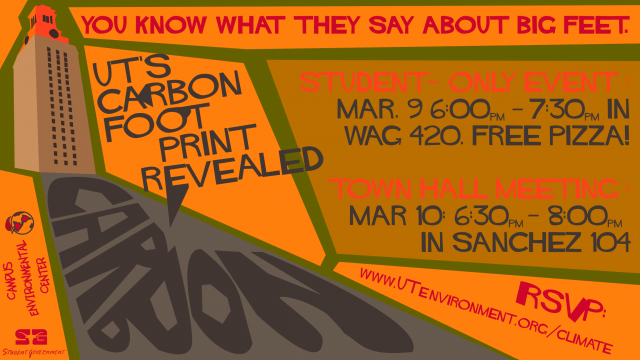 After a long and grueling wait, UT is finally set to release an audit of its carbon footprint today. UT is having a student only event tonight and is planning a full fledged town hall meeting tomorrow that will be open to the general public. The university plans to announce results and analysis from a carbon audit that was conducted in 2008 and then to open up the floor for questions. The student event begins at 6:00 p.m. today in Wagner Hall and the town hall meeting is tomorrow at 6:30 p.m. in Sanchez Room 104.